Darci Mallon writes: “The three-dimensional design of my sculpture refers to the cylindrical form evident in almost every aspect of the printing process: the myriad rollers in the printing presses; the curled lead linotypes; the towering paper rolls. 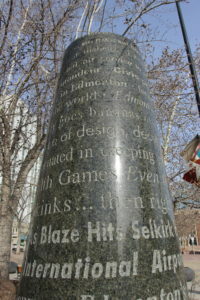 The form is vertical and conical referring to both the garden trees and the city poster pillars used to announce events. The medium is green granite, making reference to the pulp and paper industry which uses granite as the supporting core for the enormous paper rolls. Biography: Darci Mallon is a professional artist who has been teaching at various institutions since 1980. Her art has been displayed in numerous group and solo exhibitions over the past 38 years. She has an honours diploma in painting from the Alberta College of Art and an MFA in painting from York University. Mallon joined MacEwan University in 1990 where, for extended periods, she was the Chair of the Fine Art Program. She is currently an Associate Professor.